Founded in the 1870s and presently located in the northwest corner of downtown Cincinnati, Ohio, the origins of the Lloyd Library and Museum trace back to the collection of research material acquired by brothers John Uri Lloyd (1849-1936) and Curtis Gates Lloyd (1859-1926). John initially needed books and serials concerning pharmaceutical chemistry to help him run the laboratory at H.M. Merrell and Company. Curtis took a different path, seeking botanical and mycological literature to provide medicinal plant information. This combination of interests provided the basis of subject matter represented as the stand-alone institution that is now the Lloyd Library and Museum. 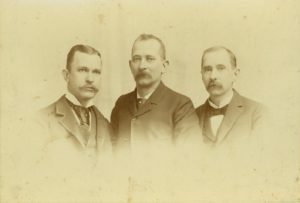 The Lloyd brothers, including middle brother Nelson Ashley (1851-1925), spent their childhoods in Boone County in northern Kentucky. At the age of 14, each brother became an apprentice to a pharmacist in Cincinnati and they all eventually became licensed pharmacists. Starting at the lab at Merrell, and through mergers, acquisitions, and buyouts, the company was incorporated as Lloyd Brothers Pharmacists Inc. in 1885. John oversaw research and development and Nelson managed the business. Curtis was admitted as a partner in 1886. The growth of Lloyd Brothers Pharmacists was directly related to their service to Eclectic physicians. 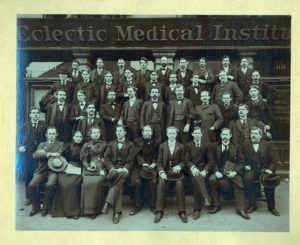 Eclectic medicine, including its flagship school the Eclectic Medical Institute in Cincinnati, supported methods “to sustain the vital forces” of patients and the Eclectic physician aimed to provide healing therapies that were in harmony with the body’s natural curative properties. They opposed the use of bleeding, purging, and unnecessary surgeries, directly challenging what they perceived as barbaric medicine taught and practiced in Europe and colonial North America. And they primarily used plant-based drugs that were indigenous to the United States as they began to form a distinctly American materia medica (the body of collected knowledge about the therapeutic properties of any substance used for healing). The Eclectics, who would later experience a decline in popularity and credibility in the early 20th century, enjoyed a zenith during the middle and late 19th century. Lloyd Brothers Pharmacists played a prominent role in their success. As the company grew, so did the Lloyd Library and Museum. Not long after Curtis officially joined the company, it became evident that his interests leaned more toward plants and fungi and his brothers excused him from any responsibility in the business. 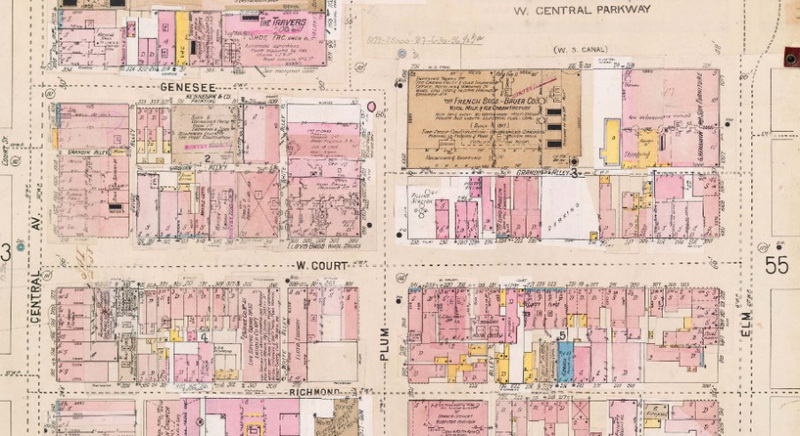 Also, the two book collections – John’s at the manufacturing plant and Curtis’s in his home – had become so large that they decided in 1902 to purchase a building at 224 West Court Street to house them all. When the collections outgrew that building, they tore it down and built a new four-story structure in the same location to hold both the books and Curtis’s growing botanical and mycological specimen collection, known as the Lloyd Museum. 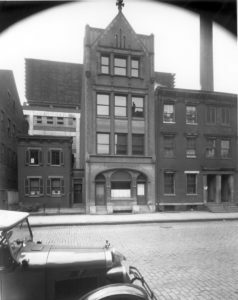 But only five years later they had to erect a building just for the library at 309 West Court Street, leaving the museum and the mycological books at 224 West Court. The library had to be expanded by 50 feet at the back of the building in 1912. The Lloyds required an almost constant addition of space because Curtis was devoting most of his time to collecting. In the late 1880s he began to travel the world in search of books and mycological specimens taking him away from Cincinnati for months or years at a time. He visited exotic places like Samoa and Jamaica but spent most of his time abroad in Europe, studying type specimens at Kew Gardens near London and making himself known to the book dealers of the capital cities. He carried with him lists of the titles he and John desired and sent full crates of volumes back home as he acquired them. By the mid-1920s the collection had become a world-class library of about 50,000 volumes, with strengths in pharmacopeia literature, Eclectic medical books and serials, and early American plant medicine publications. In 1917 Curtis Gates Lloyd, who never married and had no direct heirs, established a trust for the Library to ensure that collecting and maintenance would continue after his death. A new Lloyd Library and Museum building was constructed in 1970 at 917 Plum Street, directly next to 309 West Court Street at the southwest corner of Court and Plum. The collection was moved to the new building and the old building was torn down to make space for a parking lot. The current library building has over 30,000 square feet of space and now contains over 150,000 volumes of monographs and serials, nearly 3,000 linear feet of archival manuscripts, and around 3,000 museum artifacts. Thanks to the care and attention of all three Lloyd brothers, the Lloyd Library and Museum continues to acquire current information on its core subjects and to preserve that information for future generations of scholars.